Revolutions happen when society does not change and evolve. Stagnation and resistance create a situation in which a leap in development is required. In nature, living organisms suffering from inner blockages must heal or die. The same applies to the social organism - society - which occasionally requires drastic change in order to avoid complete collapse or violent revolution. With his oft-repeated phrase "We are the Revolution! ", the artist and social activist Joseph Beuys was intimating that true transformation develops from within, in an artistic or creative way. People are the source of metamorphosis in the social realm. But in modern times a "we" is also required - an agreement with others. The individual connects with fellow human beings, in active cooperation, as a solid foundation for healthy forms of co-existence. 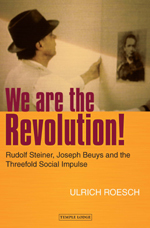 In a series of clear and insightful essays, Ulrich Roesch builds on the "threefold" social thinking of Rudolf Steiner, Joseph Beuys and others, presenting ideas for change in the context of twenty-first century life. Our world has become one through global division of labour and mutual dependence, and this calls for new thinking and rejuvenated social forms. Roesch compares the spirituality and social action of Mahatma Gandhi and Rudolf Steiner, takes the living example of a biodynamic farm as a social organism, and studies the tangible situation of the production and worldwide sale of bananas as a symptom of inequitable commerce. ULRICH ROESCH was born in 1951 in Germany, close to the Swiss border. He completed his studies in philosophy, pedagogy, German literature and social sciences. From 1971 he worked at the International Cultural Centre in Achberg, Lindau, Germany, at the Institute for Social Development Research, where his research work focused chiefly on alternative forms of economy, and organizational development. He collaborated with fellow researchers, professors Leif Holbaek-Hanssen, Ota Sik, Eugen Loebl, Joseph Beuys, Wilfried Heidt and Wilhelm Schmundt. He is now a member of the executive board, and lectures at several colleges and universities. In 1976, he co-founded the Waldorf School in Wangen, in the AllgÃ¤u district and worked as its principal. In 1982, with his wife Cornelia, he established a textile company that manufactures garments using organically cultivated cotton in social projects in India. In 2012 he helped establish the school for biodynamic agriculture in Vinobajipuram, Tamil Nadu, South India. From 1999 to 2011, he worked at the Goetheanum's Section for Social Sciences in Dornach, Switzerland, and lectured on the "Social Sculpture" course in Wangen, Achberg, Germany. His publications include: "Von der Sozialwissenschaft zur Sozialen Kunst" ("From social science to social art"), in Die Kunst des sozialen Bauens, Wangen 1993; Eine andere Welt ist mÃ¶glich - mehr gute Ideen zur Globalisierung ("Another world is possible - elements for a post-materialistic understanding of globalization'), Vienna 2003; and "An Overview of Joseph Beuys's concepts of money and capital" in What is Money?, Sussex 2010. He is also editor of and contributor to Vision and Action for Another World. Powerful ideas and inspiring practical approaches, Kolkata 2004.